Henry Holt and Co. (BYR), 9781250133380, 40pp. In this picture book celebrating Chinese New Year, animals from the Chinese zodiac help a little girl deliver a gift to her grandmother. Ruby has a special card to give to her grandmother for Chinese New Year. But who will help her get to grandmother’s house to deliver it? Will it be clever Rat, strong Ox, or cautious Rabbit? Ruby meets each of the twelve zodiac animals on her journey. This picture book includes back matter with a focus on the animals of the Chinese zodiac. Vickie Lee is an acupuncturist and Chinese medicine practitioner. 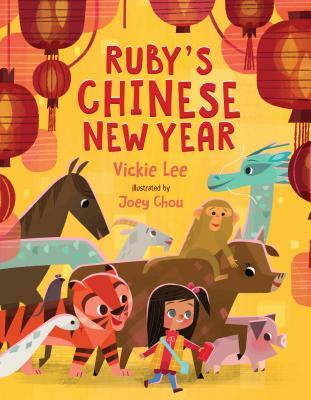 She was inspired by her daughter, Ruby, and their shared love of animals and of Chinese culture to create Ruby's Chinese New Year. She lives with her daughter and her husband in Brooklyn, New York. Joey Chou was born in Taiwan and moved to sunny California in his early teens. There he received his BFA from Art Center College of Design in Pasadena. Joey works by day as a visual development artist on feature animated films, and by night as a picture book illustrator. Joey has illustrated such books as Ruby's Chinese New Year, Monster & Son, and Disney Parks Presents: It's A Small World.